Three presidents and a chancellor pulled an all-nighter in Minsk. And after marathon talks they produced a cease-fire agreement that -- if implemented -- might stop the fighting between government forces and pro-Russian separatists in Ukraine's Donbas region. But even if it does that, the agreement does little to address the real issue at the heart of the conflict between Kyiv and Moscow: Ukraine's future political direction. In fact, the agreement fudges that in a way political commentator Leonid Bershidsky described in Bloombeg as "a time bomb...that Russia could detonate at any moment." For the Kremlin, the conflict in the Donbas was never really about the Donbas. It was about exerting pressure on Ukraine's leaders to abandon their aspirations about integrating with the West. And the agreement reached in the Belarusian capital will allow them to continue -- and possibly even increase -- that pressure. But first the good news. The clearest part of the agreement, by far, involves the actual cease-fire, which is slated to come into force on February 15. By the second day after the cease-fire, both sides are required to pull back heavy weapons from the front line to create a 50-kilometer-wide demilitarized zone that will be monitored by the OSCE. Long-range rocket launchers must be pulled back farther, creating a security zone of 70 to 140 kilometers. The wider buffer zone is a clear improvement over the cease-fire agreement reached in Minsk in September, which established just a 30-kilometer demilitarized area. The wider zone will be easier for the OSCE to monitor and it will put major population centers like rebel-held Donetsk and government-controlled Kramatorsk beyond the range of heavy weapons. But even here, there are sticking points. Chief among these is the ultimate status of Debaltseve, a government-held town and strategic railway depot that is currently surrounded by separatist forces. After much haggling, the sides could not come to an agreement on Debaltseve, and its status was not mentioned in the final agreement. "Putin’s plan to invade first & negotiate later paid off. Haggled over Debaltseve, not Crimea. Aggression rewarded again, encourages more," Russian opposition figure Garry Kasparov tweeted. Ok, now for the bad news. The rest of the agreement is fraught with peril and pitfalls. Most importantly, it requires the Ukrainian authorities to grant the separatist-held regions special status, including the right to form their own police forces and a say in appointing prosecutors and judges. Moreover, Kyiv would be barred from stripping officials in the rebel regions of their powers. Moreover, Ukraine would be required to complete constitutional reform and a decentralization of power that recognizes the "special status" of the separatist regions by the end of this year. Russian President Vladimir Putin has indicated that he views this as Ukraine agreeing to what it calls "federalization" -- one of the Kremlin's key goals. 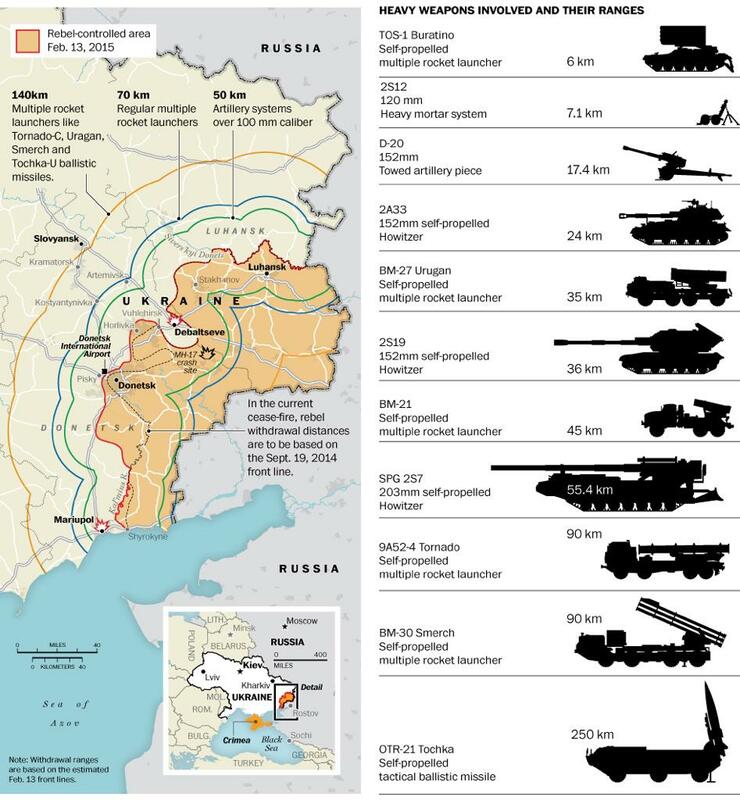 Russia is hoping that devolving power to Ukraine's regions would allow its proxies in the east to wield a veto over any attempt to bring the country closer to NATO or the European Union. In remarks after the talks, Ukrainian President Petro Poroshenko tried to put a brave face on this, insisting that he "did not accept any proposals of federalization or alike -- there will be neither federations nor autonomies." Poroshenko added that "a special status" would be worked out for the Donetsk and Luhansk regions "in the framework of constitutional changes on decentralization which will be applied for the whole of Ukraine." And a key Ukrainian demand, control of its porous border with Russia in the rebel-held areas, will not come into force until the constitutional reform and decentralization plan becomes law. And then there is all the ambiguity and language that is open to interpretation. What, for example, is an "international armed unit"? The agreement says they must be withdrawn from Ukrainian territory along with "military equipment and mercenary forces." To the Ukrainian side, this clearly means the thousands of Russian troops and weapons they say are present in Donbas. But Moscow insists -- in the face of overwhelming evidence to the contrary -- that it has no forces or weapons in Ukraine.So what's to withdraw? And what, exactly, is meant by the terms "hostage" and "detainee"? According to the text, "all hostages and detainees are to be released in prisoner exchanges based on the 'all for all' principle." Does that include Nadia Savchenko, the Ukrainian military pilot currently in the ninth week of a hunger strike in a Russian prison? Savchenko, who disappeared in eastern Ukraine in June and emerged under arrest in Russia in July, said she was abducted by separatists and spirited across the border. Poroshenko has explicitly said Savchenko's release is part of the agreement. Moscow, which claims Savchenko was involved in the deaths of two Russian journalists and was arrested illegally crossing the Russian border, has been silent. The agreement reached today in Minsk might stop the fighting in Donbas. But it does little to resolve the battle for Ukraine. Koga žele čuvati naši čuvari? The revival of South Stream on the horizon? Is Greece becoming a new Russian satellite state? Russia: How long until the economy cracks?